We're Givin' Away Some Stuff! We are giving away two great prizes generously donated by Tod's Stuff! That's right. Two different pieces were given to us by Leo Todeschini of Tod's Stuff so that we could have this contest and give them away to two lucky myArmoury.com members! 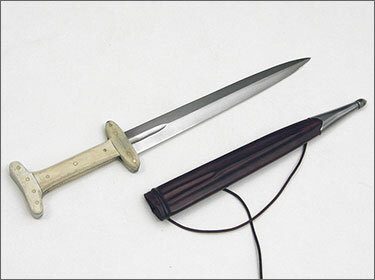 The first place prize is the Tod's Stuff Bone-handled Baselard with scabbard. Read all about it in our newly-published hands-on review by Chad Arnow. 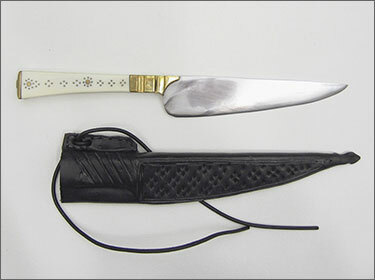 The second place prize is a really great small utility / eating knife and scabbard made by Tod's Stuff that has an antique ivory grip and beautiful pin-work. We just published a new hands-on review that talks about it. Check it out. Please take a moment to visit the Tod's Stuff Web site and give Tod a big thanks for donating these prizes. Unfortunately, being the guy running this site, I'm not eligible to win them, but I'd sure like to own both of them! Here's the twist: The longer you've been a myArmoury.com member, the better your chance of winning! Your odds of winning are based on your registration date. While anyone who enters can win, the weighted odds make it payback time for the old-time site members! Contest entry is open until Monday July 13, 2009. One entry entered for each month you've been a member? 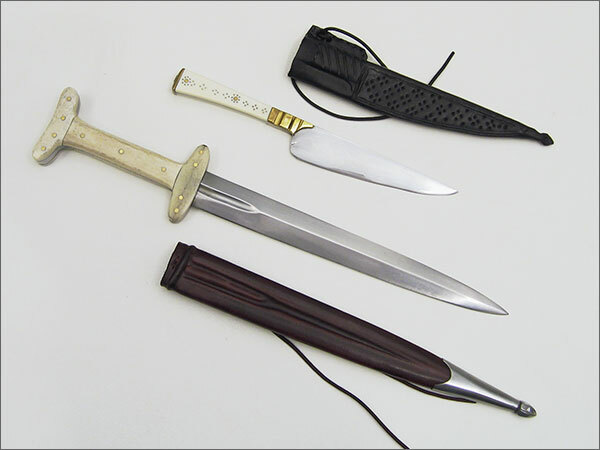 I would love to add that baselard to my kit; that is a beautiful piece. Well entered this one as I don't already have these in my collection as opposed to the last contest I declined to participate in since I already had both prizes and it seemed like a good idea to increase the odds for those who didn't that time. Great prizes by the way and another bunch of interesting feature articles ( reviews ). Oh, and thanks to Leo for his generosity in giving these as prizes. Wow! Two fantastic prizes! Thank you Nathan and Leo! Very generous! Thanks for the chance! 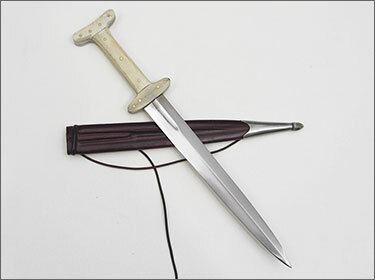 I love that baselard dagger! The other piece is nice too. What a great giveaway, whoever wins will be mighty happy! Thanks to Nathan and to Tod for making this happen! Yes thanks for the great prizes! I look forward to winning one of them!! I have been a very good lad. We'll see what karma will bring! Very nice stuff. 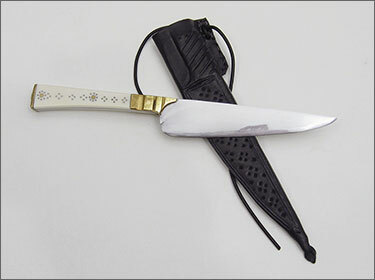 I might have to buy one of those eating knives or one of the larger chef's knives on his site. Oh man, I been needing a baselard. This would be an excellent addition to anyone's collection! May the best lord or lady win! These prizes have been in my possession for a little bit now, and I can tell you that they're really nice pieces. I think the retail value is somewhere around $300 USD each. It will be sad to part with them, but I know the lucky winners will enjoy them. Indeed! I wonder what kind of arm twisting had to be done to get them out of Chad's possession! The pieces look really nice. Tod's stuff always seems to look top notch. No arm twisting. They were never meant for me, sadly... I was just the custodian of them while we waited to get the reviews done and the contest up. How long will there be for the winner to respond? I'll be away from my computer from this Friday through July 18, I'll be in Fort Knox, Kentucky, for training with the US Army as a part of my ROTC commitments. Just in case I happen to win either piece, either of which would be the first sharp in my as of yet nonexistent collection. "Please read our detailed Rules and Limitations document for complete information and our disclaimer."